Fizik eğitimi, ilk olarak fizikçiler tarafından ortaya konulan ve yaklaşık son kırk yıldır çalışılan disiplinler arası bir araştırma alanıdır. Bu araştırmada, fizik eğitimi alanındaki temel çalışma alanları, bu alanda yayın yapan başlıca dergiler, ulusal ve uluslararası başlıca kongre ve konferanslar ile dünyada fizik eğitimi alanında çalışmalar yürüten gruplar ve bu grupların çalışma alanları irdelenmektedir. Bu çalışma, bu alanda çalışan araştırmacıların alanın mevcut durumu ve alandaki yönelimler ile ilgili sorularına cevap bulabilecekleri bir eleştirel araştırmadır. Bu bağlamda bu çalışma, Eğitim Fakültelerinin Fizik Eğitimi ya da Fen Eğitimi bölümlerinde lisans, yüksek lisans ve doktora programlarında öğrenim gören öğrencilerin fizik eğitimi alanına bütünsel bir bakış açısına sahip olmasını sağlamak amacıyla yapılmıştır. Araştırma aynı zamanda, fizik eğitimi araştırma alanının teorik ve güncel yapısını sunarak bu alanlarda bilimsel çalışmalar yapan akademisyenlerin makale, tez ya da projelerinde kaynak sağlamasını amaçlar. Physics education is an interdisciplinary research area, which was introduced first by physicists and has been researched for almost forty years. In this study, basic research areas in physics education, main journals published in this field, national and international congress and conferences, the pioneer physics education research groups in the world and their research areas were critically examined. The present study is a critical research study to find solutions to the questions of other researchers about the current status and recent trends in this field. In this respect, this study is conducted to enhance the students, who are registered undergraduate, graduate and doctoral programs of Science and Physics Education Majors of College of Education, to gain an overall idea about physics education research. In addition, by presenting theoretical and current trends, it aims to provide useful sources for physics educators in their research articles, thesis and projects. Alvesson, M. & Deetz, S. (2000). Doing critical management research. London: Sage Pub. Bao, L., & Redish, E. F. (2006). Model analysis: Assessing the dynamics of student learning. Physical Review Special Topics: Physics Education Research, 2(1), 010103 (1-16). Bardar, E. M., Prather, E. E., Slater, T. F., & Brecher, K. (2007). Development and validation of the light and spectroscopy concept inventory. Astronomy Education Review, 5(2), 103-113. Beichner, R. J. (1994). Testing student interpretation of kinematics graphs. American Journal of Physics, 62(8), 750-762. Beichner, R. (2009). An Introduction to Physics Education Research. In C. Henderson, & K. A. Harper (Eds. ), Getting Started in PER-Reviews in PER, vol 2. http://www.per-central.org/items/detail.cfm?ID=8806 adresinden alınmıştır. Borges, A., & Gilbert J. K. (1999). Mental models of electricity. International Journal of Science Education, 21(1), 95-117. Chang, Y., Chang, C., & Tsang, Y. (2010). Trends of science education research: An automatic content analysis. Journal of Science and Educational Technology, 19(4), 315-331. doi: 10.1007/s10956-009-9202-	2. Chiou, G., & Anderson, O. R. (2010). A study of undergraduate physics students’ understanding of heat conduction based on mental model theory and an ontology–process analysis. Science Education, 94, 825- 854. Colorado Physics Education Research Group (2004). CLASS: Colorado Learning Attitudes about Science Survey. http://www.colorado.edu/sei/class/ adresinden alınmıştır. Comstock, D. E. (1982). A method for critical research. In E. Bredo & W. Feinberg (Eds.) Knowledge and values in social and educational research (pp. 370-390), Philadelphia: Temple University Press. Corpuz, E. D., & Rebello, N. S. (2011a). Investigating students’ mental models and knowledge construction of microscopic friction: Implications for curriculum design and development - Part I. Physical Review Special Topics: Physics Education Research, 7(2), 020102 (1-9). Cummings, K. (2011). A developmental history of physics education research. A Commisioned Paper Written at the Request of the National Academies’ Board on Science Education. http://sites.nationalacademies.org/dbasse/bose/dbasse_080124 adresinden alınmıştır. Didiş, N. (2012). Investigation of Undergraduate Students’ Mental Models About the Quantization of Physical Observables. Unpublished PhD thesis, ODTÜ: Ankara. Didiş, N., Eryılmaz, A., & Erkoç, Ş. (2014). Investigating students’ mental models about the quantization of light, energy and angular momentum. Physical Review Special Topics: Physics Education Research, 10(2), 020127. Ding, L., Chabay, R., Sherwood, B., & Beichner, R. (2006). Evaluating an assessment tool: brief electricity and magnetism assessment. Physical Review Special Topics-Physics Education Research, 2(1), 10105-1-10105-7.
diSessa, A. A. (1983). Phenomenology and the evolution of intuition. In D. Gentner & A. Stevens (Eds. ), Mental models (pp.15-33). Hillsdale, NJ: Lawrence Erlbaum Associates. Duit, R., Niedderer, H., & Schecker, H. (2007). Teaching Physics. In S. K. Abell, & N. G. Lederman (Eds. ), Handbook of research on science education (pp.599-629). New Jersey: Lawrence Erlbaum Associates, Inc.
Dykstra, D. I., Boyle, C. F., & Monarch, I. A. (1992). Studying conceptual change in learning physics. Science Education, 76(6), 615-652. Engelhardt, P. V., & Beichner, R. J. (2004). Students’ understanding of direct current resistive electric circuits. American Journal of Physics, 72(1), 98-115. Hake, R. R. (1992). Socratic pedagogy in the introductory physics lab. The Physics Teacher, 30, 546-552. Halloun, I., & Hestenes, D. (1985a). The initial knowledge state of college physics students. American Journal of Physics, 53(11), 1043-1048. Halloun, I., & Hestenes, D. (1985b). Common sense concepts about motion. American Journal of Physics, 53(11), 1056-1065. Halloun, I., & Hestenes, D. (1998). Interpreting VASS dimensions and profiles for physics students. Science & Education, 7(6), 553-577. Hammer, D., & Elby, A. (2003). Tapping epistemological resources for learning physics. The Journal of the Learning Science, 12, 53-90. Heron, P. R. L., & Meltzer, D. (2005). The future of physics education research: Intellectual challenges and practical concerns. American Journal of Physics, 73(5), 390-394. Hestenes, D., & Wells, M. (1992). A mechanics baseline test. The Physics Teacher, 30, 159-166. Hestenes, D., Wells, M., & Swackhamer, G. (1992). Force Concept Inventory. The Physics Teacher, 30, 141-158. Hrepic, Z., Zollman, D. A., & Rebello, N. S. (2010). Identifying students’ mental models of sound propagation: The role of conceptual blending in understanding conceptual change. Physical Review Special Topics: Physics Education Research, 6(2), 020114 (1-18). Hubber, P. (2006). Year 12 students' mental models of the nature of light. Research in Science Education, 36(4), 419-439. Itza-Ortiz, S. F., Rebello, S., & Zollman, D. (2004). Students’ models of Newton’s second law in mechanics and electromagnetism. European Journal of Physics, 25, 81-89. İzci, K. (2014). Eleştirel araştırma. In M. Metin (Ed. ), Kuramdan uygulamaya eğitimde bilimsel araştırma yöntemleri (pp.413-439). Ankara: Pegem A.
Kaltakci Gurel, D., Eryilmaz, A. & McDermott, L. C. (2015). A Review and Comparison of Diagnostic Instruments to Identify Students’ Misconceptions in Science. EURASIA Journal of Mathematics, Science & Technology Eduction, 11(5), 989-1008. Kaltakci Gurel, D., Eryilmaz, A. & McDermott, L. C. (2017). Development and application of a four-tier test to assess pre-service physics teachers’ misconceptions about geometrical optics. Research in Science & Technological Education, 35(2), 238-260. Kaltakçı Gürel, D. (2017). Bağlam (Yaşam) Temelli Fizik Öğretimi Uygulamaları ve REACT Stratejisi. In A. İ. Şen & A. R. Akdeniz (Eds. ), Fizik Öğretimi-Kuramsal Bilgiler ve Örnek Etkinlik Uygulamaları (pp. 357-382). Ankara: Pegem Akademi. Kanlı, U., Gülçiçek, Ç., Göksu, V., Önder, N., Oktay, Ö., Eraslan, F., Eryılmaz, A., & Güneş, B. (2014). Ulusal Fen Bilimleri ve Matematik Eğitimi Kongrelerindeki fizik eğitimi çalışmalarının içerik analizi. Gazi Üniversitesi Gazi Eğitim Fakültesi Dergisi, 34 (2), 127-153. Laws, P. (1991). Workshop physics: learning introductory physics by doing it. Change Magazine, 20-27. Lee, M., Wu, Y., & Tsai, C. (2009). Research trends in science education from 2003 to 2007: A content analysis of publications in selected journals. International Journal of Science Education, 31(15), 1999-2002. Mazur, E. (1997). Peer instruction: a user’s manual. Prentice-Hall: N.J.
McDermott, L. C. (1991). Millikan Lecture 1990: What we teach and what is learned- Closing the gap. American Journal of Physics, 59(4), 301-315. McDermott, L. C. (1993). Guest comment: How we teach and how students learn a mismatch? American Journal of Physics, 61(4), 295-298. McDermott, L. C. (1996). Physics by inquiry (Vols. 1 & 2). Wiley: NY. McDermott, L. C. (1997). Bridging the gap between teaching and learning: the role of research. In E. F. Redish & J. S. Rigden (Eds. ), International Conference on Undergraduate Physics Education: The changing role of physics departments in modern universities (pp. 139-165). Woodbury, NY: American Institute of Physics. McDermott, L. C., & Shaffer, P. (1998). Tutorials in introductory physics. Prentice Hall: NJ. Meltzer, D. E., & Otero, V. K. (2015). A brief history of physics education in the United States. American Journal of Physics, 83(5), 447-458. Önder, N., Oktay, Ö., Eraslan, F., Gülçiçek, Ç., Göksu, V., Kanlı, U., Eryılmaz, A., & Güneş, B. (2013). 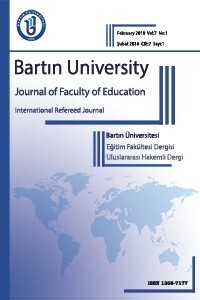 Content analysis of physics education studies published in Turkish Science Education Journal from 2004 to 2011. Journal of Turkish Science Education, 10 (4), 151-163. Rebello, N. S. & Zollman, D. A. (2005). Trends in physics education research- a personal perspective. http://web.phys.ksu.edu/papers/2005/DZ_NSF_TrendsinPER.pdf adresinden alınmıştır. Redish, E. F., & Steinberg, R. N. (1999). Teaching physics: Figuring out what works. Physics Today, 52, 24-30. Reif, F. (1995). Millikan Lecture 1994: Understanding and teaching important scientific thought processes. American Journal of Physics, 63(1), 17-32. Reif, F. (1997). How can we help students acquire effectively usable physics knowledge? In E. F. Redish & J. S. Rigden (Eds. ), International Conference on Undergraduate Physics Education: The changing role of physics departments in modern universities (pp. 179-195). Woodbury, NY: American Institute of Physics. Sokolof, D.R. & Thornton, R. K. (1997). Using interactive lecture demonstrations to create an active learning environment. The Physics Teacher, 35(9), 340-347. Sokoloff, D.R., Thornton, R. K., & Laws, P. W. (1999). RealTime physics: active learning laboratories. Wiley & Sons: NJ. Sözbilir, M. ve Canpolat, N. (2006). Fen eğitiminde son otuz yıldaki uluslararası değişimler: Dünyada çalışmalar nereye gidiyor? Türkiye bu çalışmaların neresinde? In M. Bahar (Ed. ), Fen ve teknoloji öğretimi (1. baskı) (pp. 417-432). Ankara: Pegem. Thornton, R. K., & Sokoloff, D. R. (1998). Assessing student learning of Newton’s Laws: The force and motion conceptual evaluation and the evaluation of active learning laboratory and lecture curricula. American Journal of Physics, 66(4), 338-352. Tongchai, A., Sharma, M. D., Johnston, I. D., Arayathanitkul, K., & Soankwan, C. (2009). Developing, evaluating and demonstrating the use of a conceptual survey in mechanical waves. International Journal of Science Education, 31(18), 2437-2457. Tsai, C., & Wen, M. L. (2005). Research and trends in science education from 1998 to 2002: A contentanalysis of publication in selected journals. International Journal of Science Education, 27(1), 3-14. Tzu-Chiang, L., Tzung-Jin, l., & Chin-Chung, T. (2014). Research trends in science education from 2008 to 2012: A systematic content analysis of publications in selected journals. International Journal of Science Education, 36(8), 1346-1372. Vygotsky, L. S. (1978). Mind in society: The development of higher psychological processes. Cambridge M. A.: Harvard University Press. Wells, M., Hestenes, D., & Swackhamer, G. (1995). A modeling method for high school physics instruction. American Journal of Physics, 63, 606-619. Wilson, J. M. (1994). The CUPLE physics studio. The Physics Teacher, 32, 518-523. White, B., Andrew, E., Frederiksen, J., & Schwarz, C. (1999). The Epistemological Beliefs Assessment for Physical Science. Çalışma American Education Research Association (AERA) Konferansında sunulmuştur, Montreal. Wittmann, M. C., Steinberg, R. N., & Redish, E. F. (1999). Making sense of how students make sense of mechanical waves. The Physics Teacher, 37(1), 15-21.